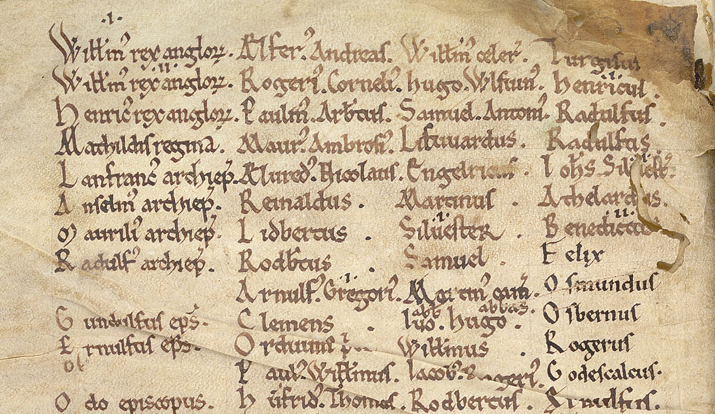 Family Names of the United Kingdom (FaNUK), a major project from the University of the West of England (UWE Bristol), has released the newly published Oxford Dictionary of Family Names in Britain and Ireland. The result of a four year detailed investigation of the linguistic origins, history, and geographical distribution of 45,600 most frequent family names in Britain and Ireland, the print and online database, offers an explanation for all names from the very common to many rarer names with 100 current bearers. Nearly 40,000 family names are native to Britain and Ireland, while the remainder reflect the diverse languages and cultures of immigrants that have settled from the sixteenth century to the present day: including French Huguenot, Dutch, Jewish, Indian, Arabic, Korean, Japanese, Chinese and African. 914 bearers in the 1881 Census, scattered throughout England, but most heavily concentrated in Gloucestershire. From Cambridge in Gloucestershire or from the university city in Cambridgeshire. It was not until late in the 14th century that the form Cambrigge became common for the university city (which was earlier recorded as Grantebrycge, Cantebrigge, and similar), and so early bearers such as Richard de Cambrige (recorded in Staffordshire Pipe Rolls in 1182) and Alan de Cambrigge (recorded in Staffordshire Assize Rolls in 1227) are almost certainly from the place in Gloucestershire. 50,516 bearers in the 1881 Census, widespread with the heaviest concentration in west Scotland; 76,576 bearers in 2011. This Scottish surname originated as a nickname from Gaelic caimbeul ‘crooked mouth’. Through folk etymology, it was often represented in Latin documents as de campo bello ‘of the beautiful field’, which sometimes led to the name being translated into Anglo-Norman French as Beauchamp. Clan Campbell is a prolific and historically influential Highland Scottish clan with many branches, claiming descent from Gille Easpaig Caim beul Ó Duibhne, who lived in the early 13th century. 5 bearers in the 1881 Census, resident in Middlesex and northern England; 1,502 bearers in 2011. This surname has two sources – an English one and a Muslim one. The rare English name is a northern pronunciation of the much commoner Farrer, an occupational name from Middle English ferrour ‘ironworker, blacksmith’, itself a borrowing of Old French ferreor. The Muslim name is from a personal name based on Arabic faraḥ ‘joy, happiness, delight’. There are many Muslim families with this name in present-day Britain. Its most famous bearer is Mo Farah, the long-distance runner and British Olympic gold medallist, who was born in Mogadishu, Somalia. The research for this project was carried out by a team of historical linguists, medieval historians, lexicographers and expert advisers on Irish, Scottish, Welsh and recent immigrant names. The team analysed records from published and unpublished sources dating from the 11th to the 19th century to enable new and detailed explanations of names that is much more reliable and up to date than those currently available. Much of the evidence is new, drawn from previously untapped medieval and modern sources such as tax records, church registers, and census returns. Professor Richard Coates of the University of the West of England, one of the editors of the Dictionary, commented “There is widespread interest in family names and their history. Our research uses the most up-to-date evidence and techniques in order to create a more detailed and accurate resource than those currently available. We have paid particular attention, wherever possible, to linking family names to locations. The Family Names of the United Kingdom website also offers details about papers and articles related to the project, and more information about the resources they have created.